Post Foetry: Spam Lit in a Block of 15 Scroll Boxes??? 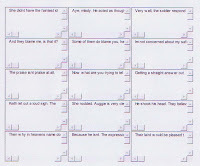 A few days ago, I received this piece of Spam Lit; sorry, the picture's not very clear, but each scroll bar contains one sentence. I have just discovered that if you click on the picture, you will see a large version of it. The ad itself was for, uh, a male product; the one picture that slid through Gmail's Spam filter was somewhat graphic. Now I'm a married adult, so the content wasn't shocking to me, but what about a kid getting this kind of an email? Yikes! Makes one want to lock their kids in a room until they turn 18. My question is: how is this setup supposed to fool the spam filters? Anyone else receive this type of Spam Lit, and what do you know about it?